The Jungle Book is a 1967 animated, musical fantasy film produced by Walt Disney Productions and directed by Wolfgang Reitherman. It is inspired by Rudyard Kipling's “Mowgli” stories found in his 1894 collection of stories, The Jungle Book, from which this movie also takes its name. 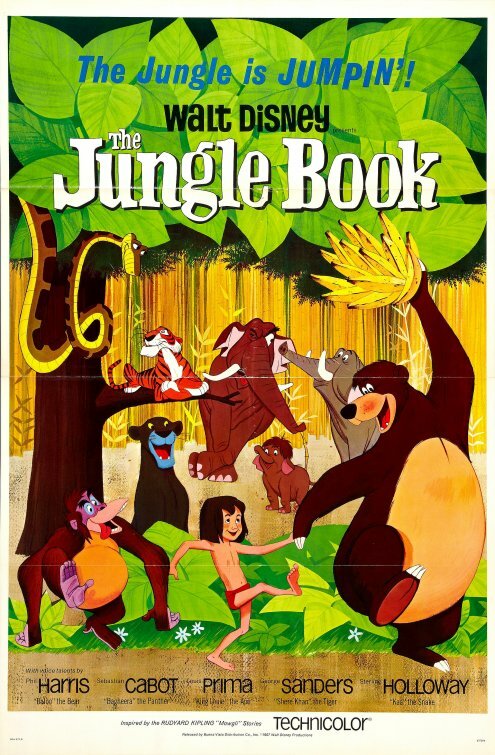 The Jungle Book is the 19th Disney animated feature film and is also the last film to be produced by Walt Disney, who died during its production (1966). Disney's The Jungle Book focuses on a talking panther and bear who try to convince a human boy that he must leave the jungle before an evil tiger kills him. The Jungle Book opens in the deep jungles of India. Bagheera the black panther (Sebastian Cabot) finds a human male baby in a basket in the deep and gives him to a mother wolf who just had cubs. She raises the boy along with her own cubs. Ten years later, the human boy is Mowgli (Bruce Reitherman, the director's son), a feral child who lives among the wolves as if he were one of them. However, the wolf tribes learn that Shere Khan (George Sanders), a man-eating Bengal tiger, has returned to the jungle, and that the human-hating tiger wants to kill Mowgli. Baheera volunteers to take Mowgli to the “Man-Village,” a nearby human settlement, but Mowgli is determined to stay in the jungle. Mowgli finds a sympathetic animal in Baloo the sloth bear (Phil Harris). The laid-back, fun-loving bear decides to raise Mowgli himself, but will Baloo and Mowgli do the right thing before Shere Khan strikes? I love the beautiful background art for The Jungle Book, even the foliage in the foreground that is animated is nice. The characters that most entertain me are Baloo and Shere Khan; I think I am becoming a bigger fan of the late George Sanders, who gives voice to Shere Khan, every time I see him in a movie, even if I have seen that movie previously. Beyond that, I am not particularly impressed, amused, or entertained by The Jungle Book the way I am by Disney films I consider exceptional (Bambi, Peter Pan, and Pinocchio to name a few). I have to admit that having seen it for the first time (as far as I can remember) I can understand why some consider it a “beloved Disney classic.” It is simply a Disney classic that I like, but don't love. The text is copyright © 2017 Leroy Douresseaux. All Rights Reserved. Contact this blog for reprint and syndication rights and fees.